From Goodwill. It's just a Rogue, they have them on sale for $46 brand new on musiciansfriend right now, and this one needs new strings and a tuner ferrule so maybe it wasn't the steal of the century, but for $20 I couldn't turn it down. I've always wanted to learn and Lauren having played violin in school has been mando-curious as well. Other than the nasty strings on it, it looks to be in great shape. It's similar to mine, just without the pickup. They're surprisingly decent little guys... Great to start with if nothing else. 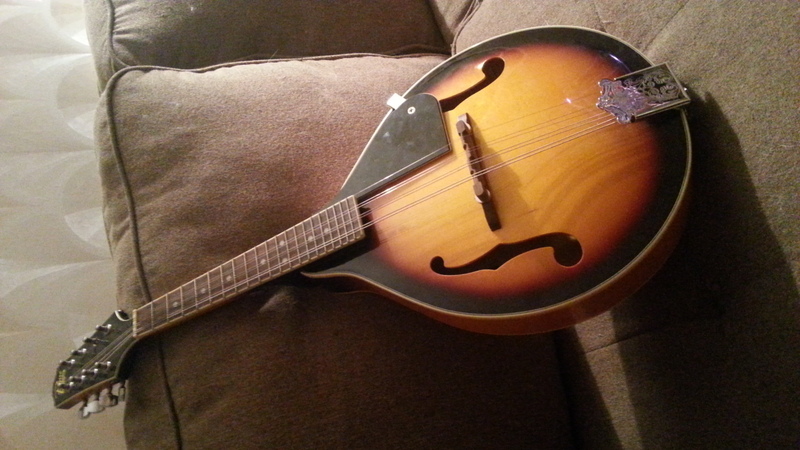 I have found it decently intonated and easy to play, sound is appropriately bright. New strings are on it now. Used some lemon oil on the neck, cleaned it with a damp cloth. Looks like new and plays decent. Was kinda my problem too.